KeepSolid Sign got an early Christmas gift – recognition from the experts. Our e-signature software was recently scrutinized by the trusted B2B directory FinancesOnline.com, and emerged with a score of 8.3 out of 10 and a user satisfaction rating of 94%. 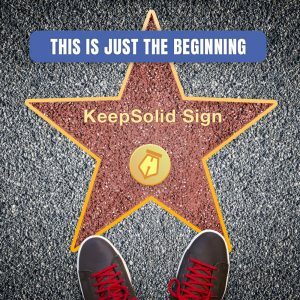 KeepSolid Sign was described by reviewers as a useful tool that streamlines both processes and workflows that require signatures, such as contract signing, approvals, business deals, and more. Reviewers also noted the wide usage of KeepSolid Sign across applied business, enterprise, and educational institutions. With this software, users can sign documents, create document templates, store and share signed files, and monitor the status of their deals in real time. With its features and capabilities, KeepSolid Sign was conferred with the 2017 Rising Star Award and Great User Experience Award by FinancesOnline for the best e-signature software. These badges of distinction are accorded to deserving products that have gained a solid customer following because of robust features and total usability. Our product was also recommended on the platform’s top e-signature software alternatives list. We wish to thank FinancesOnline for this great recognition! It humbles and inspires us to receive these awards that serve as a testament to our efforts and dedication. Thank you for your support and staying tuned with our news. There’s more to come!